The Missouri Supreme Court recently ruled that the city of St. Louis acted within its authority to approve a 43 percent minimum wage increase to $11 an hour by 2018. This decision is currently being appealed, and Missouri state legislators are considering legislation that would nullify the municipal wage hike and set one minimum wage at the state level. Minimum wage proponents in the city have portrayed the proposed increase as a no-lose proposition. The labor union funded group Missouri Jobs With Justice has even suggested a minimum wage hike would help local businesses and the economy. But a wide body of economic research, including a 2014 Congressional Budget Office (CBO) report, concludes that minimum wage hikes reduce job opportunities especially for the young and less-skilled. 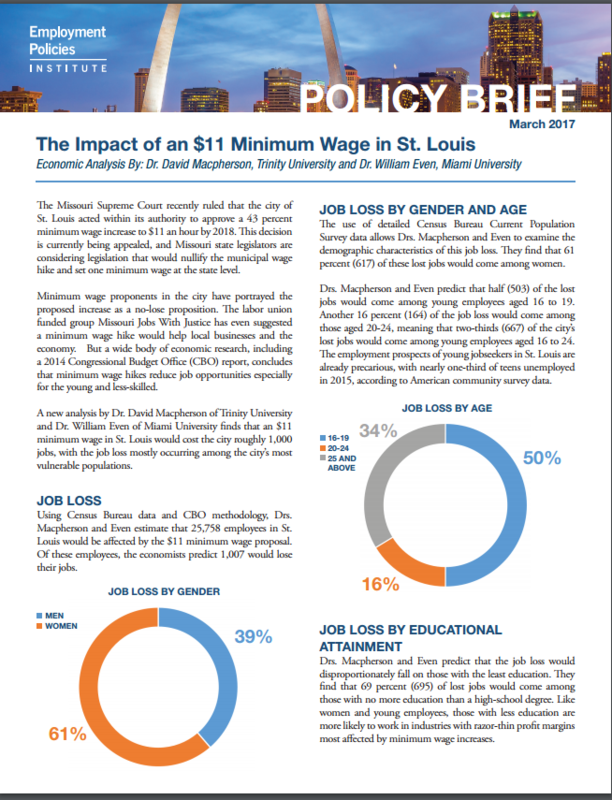 A new analysis by Dr. David Macpherson of Trinity University and Dr. William Even of Miami University finds that an $11 minimum wage in St. Louis would cost the city roughly 1,000 jobs, with the job loss mostly occurring among the city’s most vulnerable populations.